when you use it . . . they gaze in wonder . . . everyone of them wants a Magic Case. 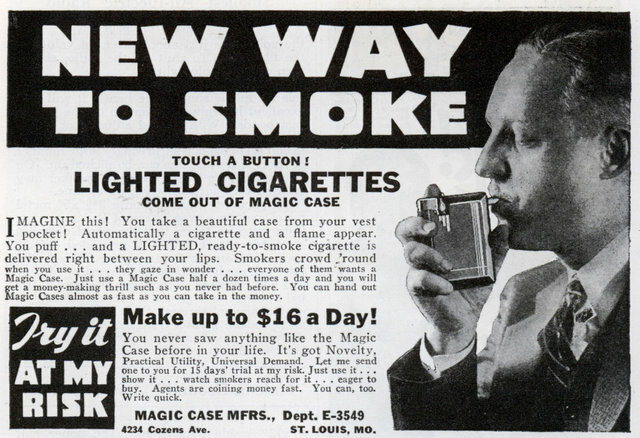 Just use a Magic Case half a dozen times a day and you will get a money-making thrill such as you never had before. You can hand out Magic Cases almost as fast as you can take in the money. Practical Utility, Universal Demand. Let me send one to you for 15 days’ trial at my risk. Just use it . . show it . . . watch smokers reach for it . . . eager to buy. Agents are coining money fast. You can, too. Write quick. 4234 Cozens Ave. ST. LOUIS, MO. I just bought one of these too. I think its the coolest thing. What did u pick yours up for, Im just trying to figure out the value? This is the only page i have been able to find that says anything about the little contraption. If you have any information about it, that would be appreciated. Actually I picked mine up on ebay, I’m not a collector or anything but i just thought it was really neat, in fact i dont even smoke that much, but if i did i wanted to do it in style. I got mine for 65 bucks i think it was good deal, so where did you get yours at? I’ve an original 1935 one still in box, never been used still has the instructions, left to me by my granfather. If your interested or can point me in the right direction of anyone who might be looking for one, please get in touch. I was so glad to find this site! I just found one of these in great working condition, picked it up for 20 bucks at a local estate sale thought it was too good a deal to pass by, would love to find an actual value! (Not that I want to sale it) ! I have boxed one in near new, and have pictures please email< I will be selling it on Ebay shortly. I have one of these cases. It has been stored at least 50 yrs. The lighter is stuck, I did not try to force it open. It is for sale, I just do not know the value of it. Other than the lighter problem it is in excellent condition. I have one that was the first present a. new suitor gave me in 1937 when I was 21. I had recently lost my hand in a car accident and it was such thoughtful gift. It worked like a charm, but was a little noisy as I found out when I tried using in class in graduate school Smoking was allowed but quietly. Mary. In 1937 you were 21? That would make you 95 now and visiting odd sites on the internet. Impressive. Mike, Do you consider this to be one of the “odd sites” on the internet? 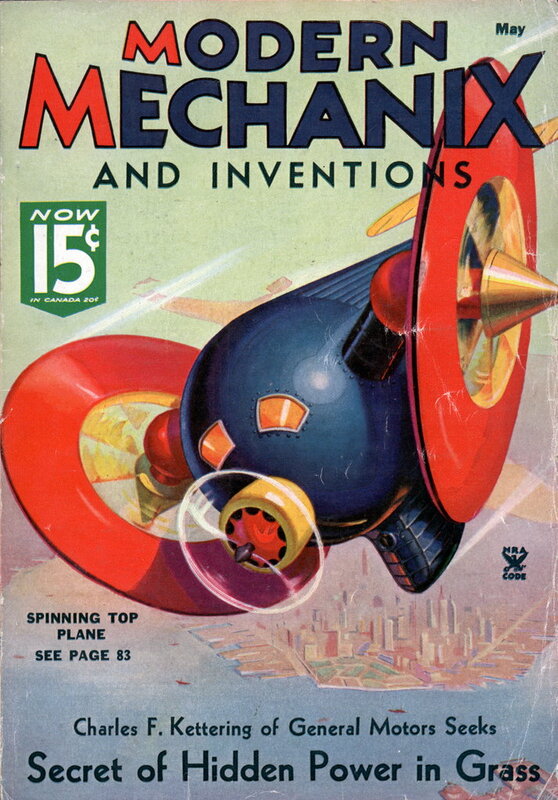 Old issues of Modern Mechanix and related historical popular publications?